Home/Central banks, Emerging markets, English, Financial crisis, Global economy, Zombie companies/Turkey: A harbinger of a global debt crisis? The economic crisis brewing in Turkey seems to have surprised many. This was probably, at least partly, due to the ‘period of tranquility’ created by the central banks with theirs ‘unorthodox measures’. Many seem to have imagined that the “synchronized global growth” spurt were here to last. But, it was just a mirage, run by the stimulus of China and the major central banks. As we warned in May, the global quantitative tightening will bring an end to the current business cycle. This is for a multitude of reasons (see Q-review 1/2018), but the most pressing of them is the fact that QT will raise interest rates and suppress liquidity. It will raise the costs of indebted companies, drive zombie companies to insolvency and ultimately crash the asset markets. A global debt crisis of epic proportions and depression are likely to follow. Turkey is showing what it might look like. The current business cycle has had two exceptional features. First has been the steep rise in the balance sheets of central banks and the second the very fast growth of the non-financial sector debt, especially in the emerging economies. Figure 1 presents the private non-financial sector debt as a percentage of GDP in advanced and emerging economies. It shows the miniscule deleveraging in advanced economies and the harrowing rise in the private non-financial debt in the emerging economies since 2009. The rise of the non-financial private debt in emerging economies coincides with the QE programs of the major central banks. QE of the Fed started in November 2009, QE2 in November 2011 and QE3 in October 2012. QE of the Bank of Japan started in late 2010 and the QE of the ECB started in March 2015. These contributed especially on the global capital flows (see this and this). From the major central banks, the Fed has switched to quantitative tightening (QT), the ECB should taper its purchases during the fall and the BoJ is diminishing its purchases. All this is expected to lead to a contraction in the global balance sheet of the major central banks. This contraction may already have started or it will start in the fall. It will be the first time in history when the global central bank balance sheet shrinks in a trending manner. Global QT will deflate the global debt bubble the global QE helped to create. The central bankers thus have a debt conundrum. The early signals of inflation in the US and the ability to counter the approaching recession compel the central banks raise interest rates. But, just the effort to prepare for a recession by raising rates may generate a global debt crisis and recession. Effectively, the central bankers have painted themselves into the corner. Thus far, most debt crises have been triggered by mistrust towards the finances and currency of the indebted governments. This time, the private companies are considerable more indebted than the governments. Because of this, the coming debt crisis will be harder to defeat than the previous ones. If the companies have borrowed massively from abroad, the falling external value of the currency will increase their interest payments and diminish their ability service their debts thus feeding the currency crisis. 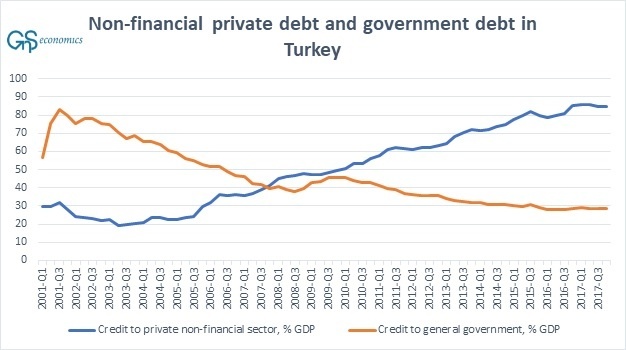 This is the heart of the crisis in Turkey (see Figure 2 below). The common response to a debt and/or currency crisis has been raising the interest rates and shoring up the government finances (with e.g. structural reforms) to increase the confidence of the international investors. More drastic measures have included capital controls, defaults or calling the IMF for assistance. However, with a highly indebted private sector, the rate raises damage the ability of companies to service their debt and to roll them over especially, if they are unable to halt the fall of the currency. Although the “order” of President Erdogan not to raise rates may seem counterintuitive, the interest rate rises could just wreak more havoc by bringing more burden to the already damaged corporate sector. An alternative response, a structural reform, improves the long-term growth prospects of an economy but may be detrimental to the private sector in the short-run by cutting the excess lending, running down government sponsored enterprises and by cutting government spending. Capital controls, in turn, would seize the flow of capital out of the country, but they would also almost surely kill the ability of the companies and banks to borrow from the international financial markets. Default in foreign currency denominated debt would do the same. Further, the IMF programs would bring some financial relief, diminish illiquidity in the banking/corporate sector and enforce economic and financial reforms. But, they would also establish austerity measures, force structural reforms and increase competition in the private sector, which could damage the already fragile and indebted corporate sector thus flaming the crisis. Therefore, the IMF programs need probably to be designed differently. There’s is also no guarantee that they will be efficient in curbing the crisis this time around. Still, it may be the best option for Turkey. The world seems to be utterly unprepared for what’s about to be unleashed. Prior heroes, the central bankers, are now the culprits because they have been the ones to provoke the almost uncontrollable rise in debt with their zero interest rates and QE –programs. The standard crisis fighting measures are likely to prove insufficient and even counterproductive in some cases. It will require a truly new approach to counter the global debt crisis and depression that are well on their way. Still, when the crisis hits, it’s likely that the “new old” measures (like QE) will be tried over and over again until their effectiveness will be totally gone and/or the value of the fiat moneys will be lost. Property (land), physical gold and cash of respected (sound) currencies and countries are the only safe havens this time around. This is because the coming crisis will be likely to engulf all corners of the world. On the flip side, the crisis will create a buying opportunity of a life-time. One just needs to secure liquidity of assets when the crisis hits. Because of the magnitude and reach of the coming economic collapse, this will not be easy. Time is of the essence. By Tuomas Malinen| 2018-11-01T23:48:19+03:00	elokuu 16th, 2018|Central banks, Emerging markets, English, Financial crisis, Global economy, Zombie companies|Kommentit pois päältä artikkelissa Turkey: A harbinger of a global debt crisis?